Two regular tetrahedrons, piercing each other, float through space as a planetoid. The light-coloured one is inhabited by human beings who have completely transformed their region into a complex of houses, bridges and roads. The darker tetrahedron has remained in its natural state, with rocks, on which plants and prehistoric animals live. The two bodies fit together to make a whole but they have no knowledge of each other. 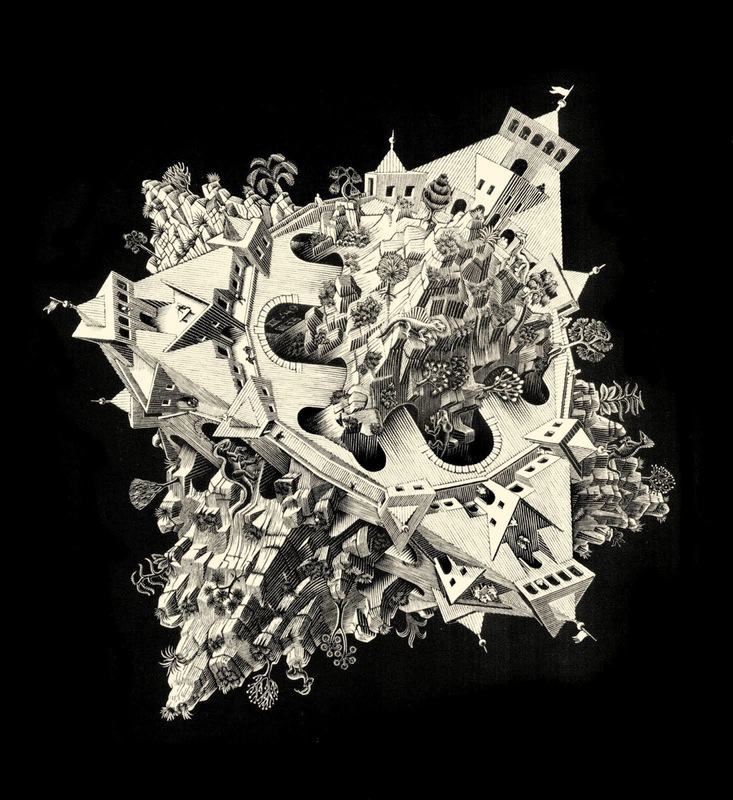 Right now, Escher's Double Planetoid seems an apt metaphor for Malibu. Only here, the developers are not only aware of the natural resources in the undeveloped side, but covet that land and seek to pave it over, transforming what is left of the natural world into strip malls—high end, pretentious strip malls with stratospheric rents, but still generic development full of the same ubiquitous chain stores that are invading scenic and historic communities around the world, from Florence, Italy to Rockport, Maine. The Malibu Village Shopping Center just sold to an out-of-state real estate investment company for an estimated $150 million, up from $30 million, the last time it changed hands. That's a lot of money to recoup. Wagers are already being made about how many of the existing tenants, including the movie theater, will be able to afford to stay when the time comes to renew their leases. Malibu residents, less than enthused about the mall-ification of Malibu and concerned that the fast-tracking of the Civic Center sewer will generate a building frenzy, have been fighting back for years, but have gained little traction with city officials. In 2006 a concerted effort began to create a formula retail ordinance and give voters an opportunity to weigh in on large-scale commercial development, not only in the Civic Center but throughout Malibu, putting the decision making power for big projects in the hands of the voters. It's been an agonizingly slow process, and according to the grassroots organization Preserve Malibu, more than 50 chains have opened or signed leases during that eight-year period, but that's nothing compared to the potential maximum build-out of the Civic Center area once the sewer system is in place. Over a million square feet of commercial development is possible. Preserve Malibu created this infographic to show the size and location of potential future development in the Civic Center area of Malibu. Critics have objected to the inclusion of the Pepperdine projects, because the university is not within the city. 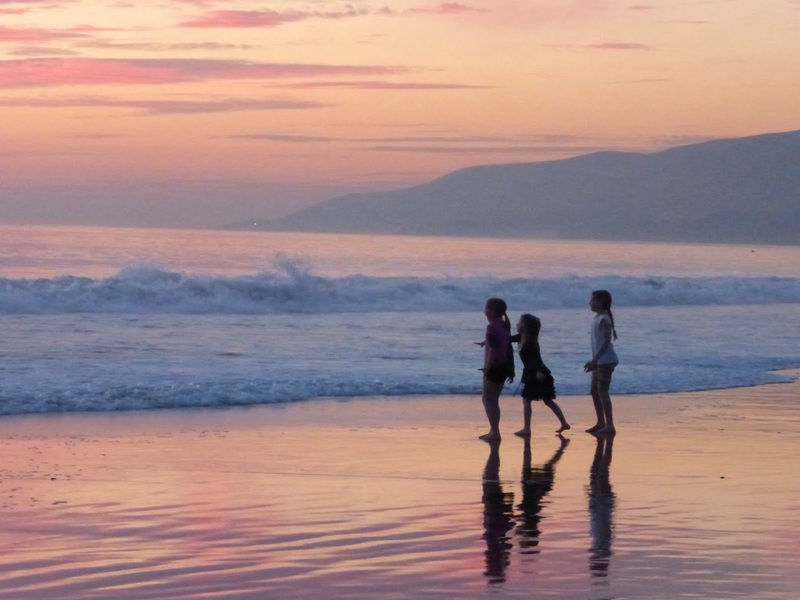 However, the people of Malibu and Malibu's infrastructure, especially Pacific Coast Highway, have to absorb the impact from the development and no one can argue that it isn't cumulative. The past three years of the push for an ordinance have been worthy of anything Irish satirist Jonathan Swift could have concocted for his Lilliputians. In the latest round, city staff proposed that the election be postponed until April 2016 because the petition didn't include the words "special election." 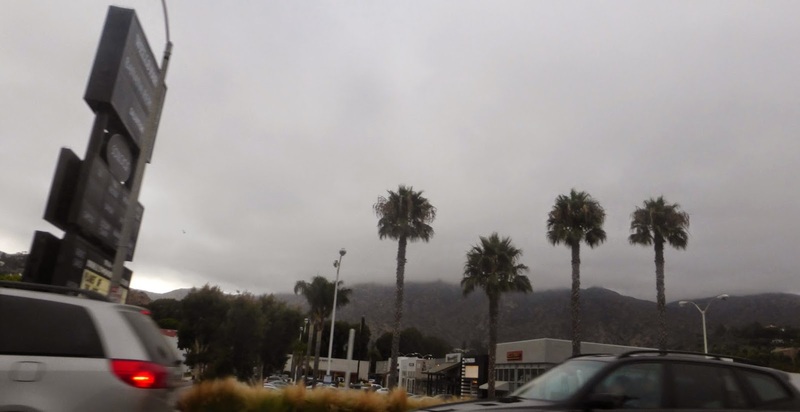 However, the Your Malibu, Your Decision Act, which would require developers to seek voter approval for any project bigger than 20,000 square feet and also limit chain stores, has finally been approved by the Malibu City Council for the November 2014 ballot. The Malibu Post took a look at the act back in March, when the signature-gathering effort was announced. That approval to place the initiative on the November came grudgingly, reluctantly and even angrily from some on the dais, but it was given, after almost two hours of public testimony, by four of the council members. In the words of Councilmenber Laura Rosenthal, "The Initiative absolutely has to be on the November ballot, whether I'm for it or against it." The fifth council member, Joan House, expressed the opinion that the measure should be postponed until April 2016 to provide more time to study it, despite the fact it met all of the legal requirements to be placed on the November ballot, and the city attorney and consultants could find no legal cause to postpone the vote. The council then voted unanimously to approve their own ordinance, which is similar to the ballot initiative but only applies to the Civic Center, not the rest of the community, and can be altered at any time. If the ballot initiative passes, it will supersede the city ordinance, and cannot be altered except by another election. House may have been the lone dissenting vote on the council regarding the ballot initiative, but she had company from developer interests during public comment. The Malibu Chamber of Commerce, Malibu Association of Realtors and several developer lobbyists predicted lawsuits, doom and destruction if the initiative passes. 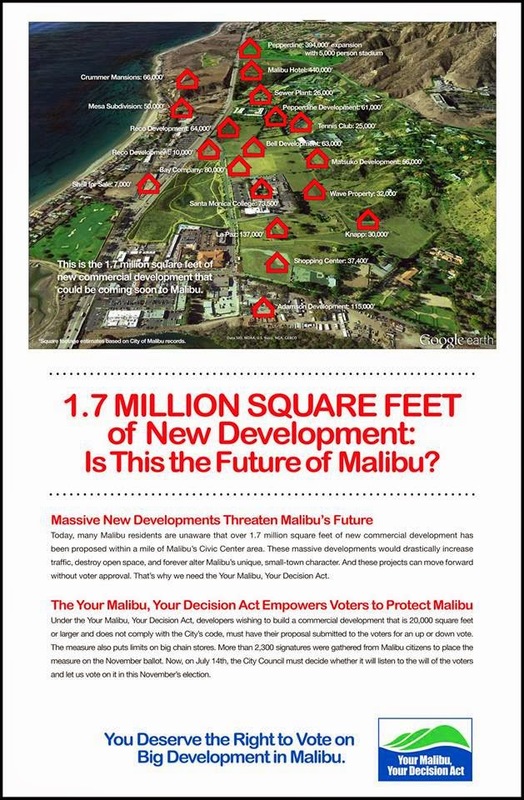 That just about sums up the fears of the developer interests opposed to the Your Malibu, Your Decision ballot initiative. 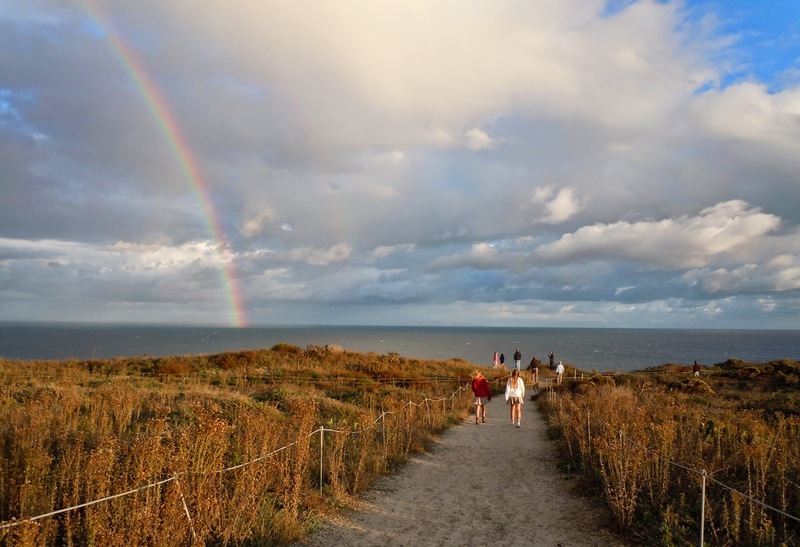 It's not a surprise that these groups oppose the measure, although one wonders what the Realtors have to gain when development clogs Pacific Coast Highway to the point that living in Malibu is no longer desirable or even feasible. However, these groups and the lobbyists who represent them are protecting their own interests and have every right to do that. What is troubling is the paternalist mindset that continues to govern this lobby. There's an attitude that the public isn't qualified or sufficiently educated to understand what's happening. This isn't new. It's the same old modernist manifesto that drove the post WWII onslaught of unchecked development in California. It's also the mindset that, in the 19th century, believed that "rain follows the plow," and embraced manifest destiny. Even some of the language used to deride the ballot initiative dates from an earlier era. One real estate agent described the initiative as a “dog’s breakfast.” The last time the Malibu Post encountered that particular insult was in an Agatha Christie murder mystery, c. 1933. 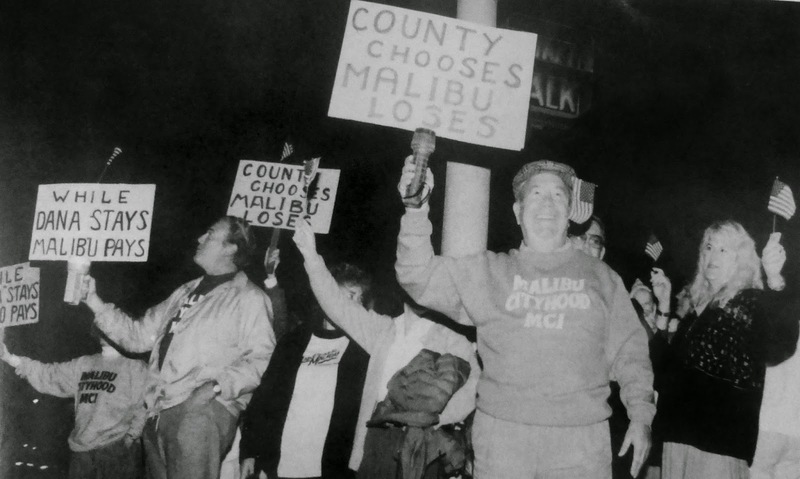 Activists in a 1989 Malibu Times photo protest Los Angeles County Supervisor Deane Dana, whose paternalistic attitude toward Malibu and determination to protect development interests instead of natural resources and the needs of the residents fueled the cityhood movement. This paternalistic, expansionist mindset is increasingly anachronistic in a postmodern era when the realization that resources are limited and dwindling has finally sunk in to all but the thickest skulls. But that doesn't change the fact that the 4000-5000 people who actually live in Malibu year-round, and vote, and have views on what Malibu's future should be are frequently treated like recalcitrant children. In Malibu that paternalism has led to some spectacularly awful land use decisions. Many of these date from the era immediately preceding cityhood, and thanks to fiercely protective residents and environmental activists, some of the worst projects have been derailed but not all. 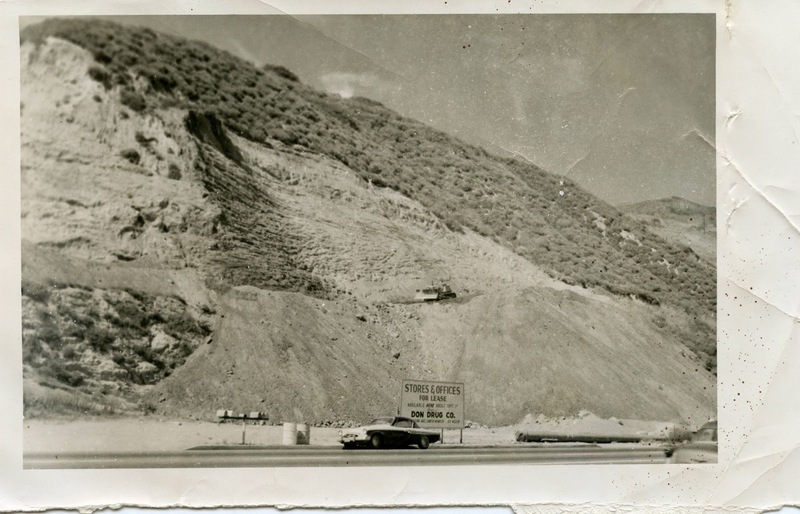 "Stores and offices for lease," a sign reads on Pacific Coast Highway in this photo from the Pepperdine University Digital Archive. The car appears to be a 1955 Studebaker, which probably dates the scene to the late 1950s. This stretch of PCH is roughly the same location as the photo below. The fight over the fate of the Civic Center isn't the only development debate in the community. Ugly, ill conceived development lines PCH east of the Civic Center. For nearly six miles, from Santa Monica to the Civic Center, a solid wall of houses, apartments and unlovely office buildings line the highway, providing a continuous wall that lines both sides of the road and mars even the few remaining glimpses of the ocean. This isn't what visitors and residents come here to see, which is why the ballot initiative, unlike the city formula retail ordinance passed the same night the council approved the ballot measure for the November election, includes all commercially zoned property in the city. For the past 31 years, diners at the Malibu Colony Coffee Shop could count on a decent portion of pancakes, eggs, sausages and star sightings. It was the local hangout where major movie deals were made over doughnuts and, at lunch, mechanics shared the same Formica counter with the mega-rich. But this week, the cafe will close to make room for a new mall in a move that many residents bitterly complain is part of a new Malibu--more upscale and less down-to-earth. "I guess this is progress," lamented owner Natalie Brown, who has run the coffee shop with her husband, Herb, for the past decade. 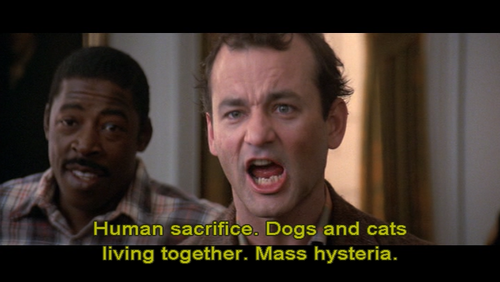 "But a lot of people consider it a huge loss. This place is a Malibu landmark. This place is Malibu." 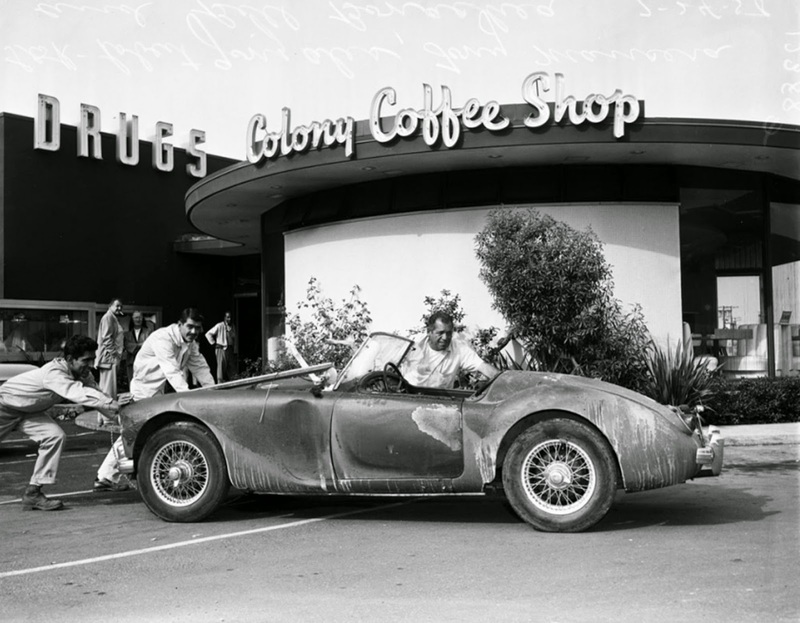 This is the only photo of the exterior of the Malibu Colony Coffee Shop I could find. It's from a news story about a car crashing into the drug store adjacent to the Colony Coffee Shop. The distinctive oval building was designed by pioneer African American architect Paul Williams in 1957, and torn down by the owner of the shopping center in 1989 out of sheer garden variety pigheadedness and what can only be described in hindsight as a colossal lack of vision. More than 2000 people signed a petition opposing the demolition plan. That letter of protest ran as a full-page ad in the Malibu Surfside News. "The atmosphere, spirit and history of the Colony Coffee Shop cannot be duplicated," the ad stated. "It has been more than a concrete and glass building. It has held a special place in our hearts." "People say I'm being cold-hearted about the building, but I've got more memories than most about it. Hell, my father built it." "Unlike the coffee shop's many patrons, who I feel are thinking with their hearts and stomachs, I am going to make this decision like a doctor, with compassion, but with objectivity. 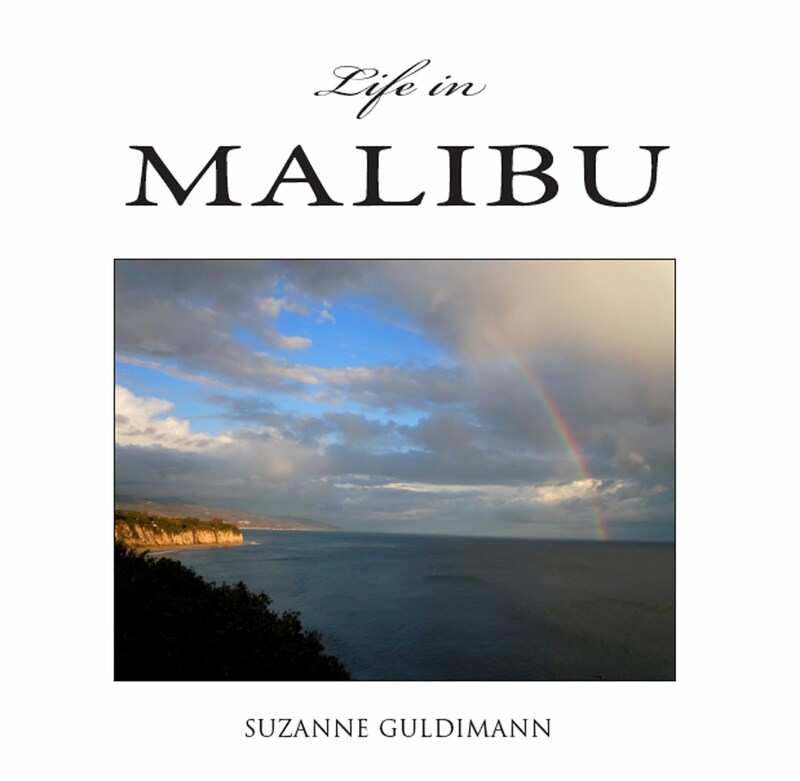 I definitely want to retain the unique character of Malibu. . . . but I want the town to have a world class restaurant, a first class coffee shop, and a local health and juice bar." A doctor, eh? Is it too late to sue for malpractice? Crummer tore down an architectural landmark to make way for his generic shopping center. When the “world class restaurant” finally arrived, it didn’t last long. The space that housed Granita has been empty for almost 10 years. The building designed by legendary Black architect Paul Williams that was sacrificed was part of Malibu’s cultural heritage and can never be replaced. One of the most poignant speakers at the July 14 City Council meeting was John Evans, co-owner of Diesel Bookstore, which is being driven out of the Civic Center area for a second time due to stratospheric rents and decreasing foot traffic. The space that Diesel is being forced to leave was home for almost 20 years to my parents' gallery. They were the original tenants and opened in an era when the owner and all of the other shopping center tenants were local residents. This is the space soon to be vacated by Diesel Bookstore. Long before it was Diesel, it was home to my parents' gallery. 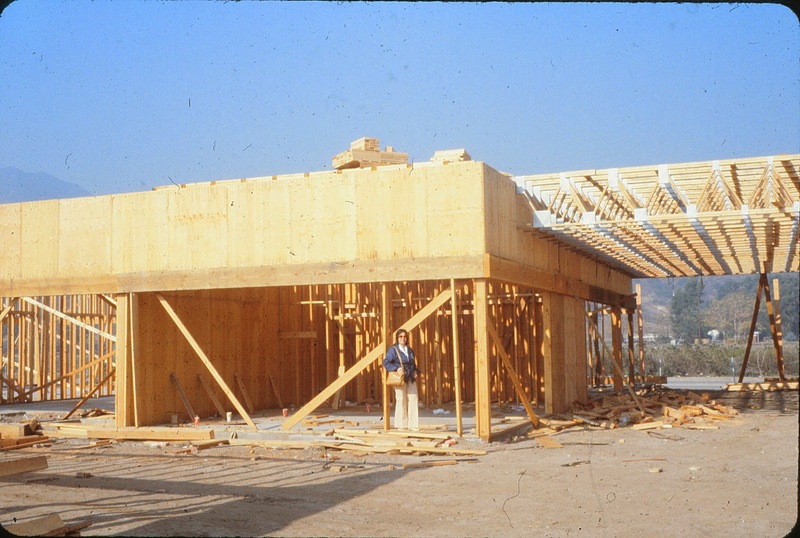 This photo was taken in 1978, when the Malibu Country Shops building was just going up. That's my mom standing in front, planning what it would be like when it was complete. A holiday ad from the 1980s shows the center's tenants, including the author and her parents. 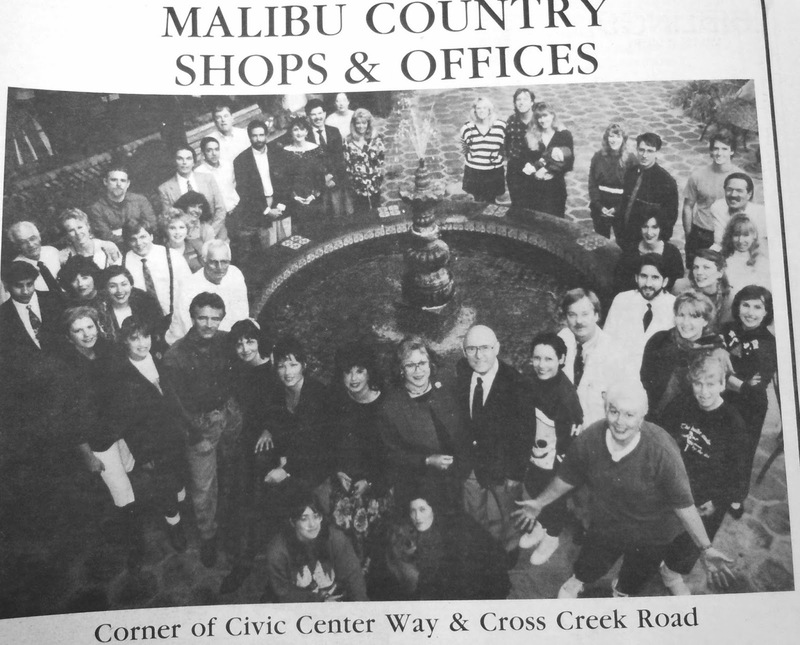 In those days, shops like Malibu Books and Company, Tops Gallery, the Godmother were owned and operated by Malibu residents and employed local people. This kind of environment is an endangered animal not just in Malibu. Globalization and commercialization is happening all over the world, but that doesn't mean we have to put up with multinational corporations and hedge funds taking over the town, and we don't have to permit excessive development that is not in line with the City of Malibu's vision and mission statements. That's why community activists are working so hard to pass the Your Malibu, Your Decision Act. It may not be perfect, but proponents of the measure see it as a crucial tool that can be used to stem a tide that has the potential to become a tsunami of commercialism if left unchecked. In Escher's Double Planetoid there is balance. The inhabitants of the two tetrahedrons live separate existences unaware that the other but the two sides still combine to form one world. In Malibu, we have the awareness but not the balance. Right now, one side threatens to irrevocably overwhelm the other. I don't know what the answer is, but I do know the residents of Malibu want a say in it, and I also know that the half a million people who flocked to Malibu over the 4th of July weekend didn't come for shopping opportunities and chain stores. They came, in the words of the Malibu Vision Statement, because "Malibu is a unique land and marine environment," and we, the residents, are still committed to "sacrifice urban and suburban conveniences in order to protect that environment and lifestyle and to preserve unaltered natural resources for present and future generations." This is the City of Malibu's mission statement, inscribed larger than life in the foyer at city hall. It's not supposed to be just a wall decoration like those vinyl decals of inspirational words or Winnie-the-Pooh that they sell at Target, it is this city's core value and raison d'être. 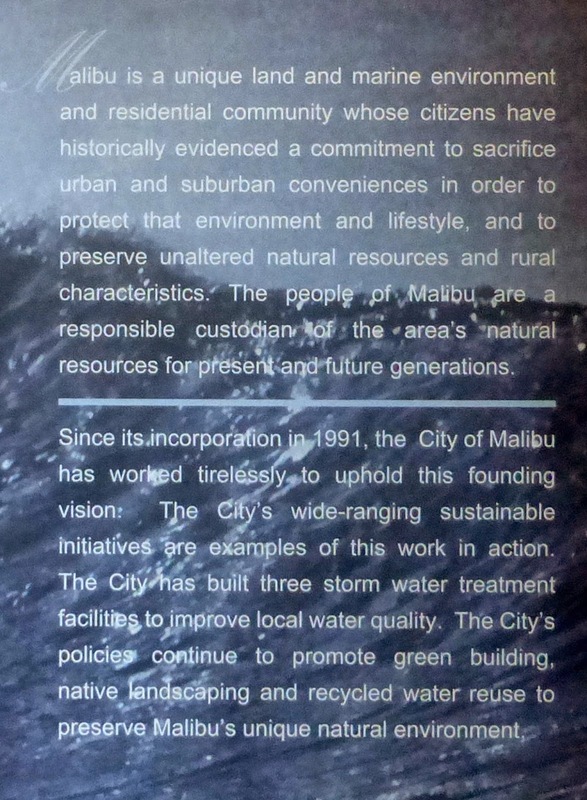 The Malibu Vision Statement is written in three-inch letters all over the wall of City Hall. Maybe it's time that some of our city officials and the developers who regard the city as their personal cash cow took a moment to read and reflect on that. There are many things in Malibu that cannot be bought, or sold, or replaced when they have been destroyed. Not at any price.